Sometimes I wonder if we give students too many handouts. Especially when I consider how often they look at them. Or on the other side of the scale, how reliant students can become on using handouts to produce their ‘own’ work. 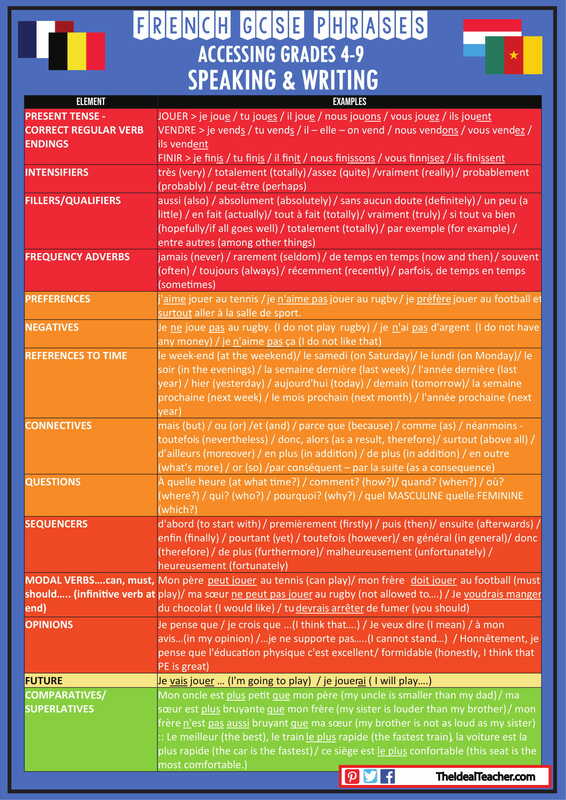 Not Another Useless Handout for French GCSE Speaking and Writing…! 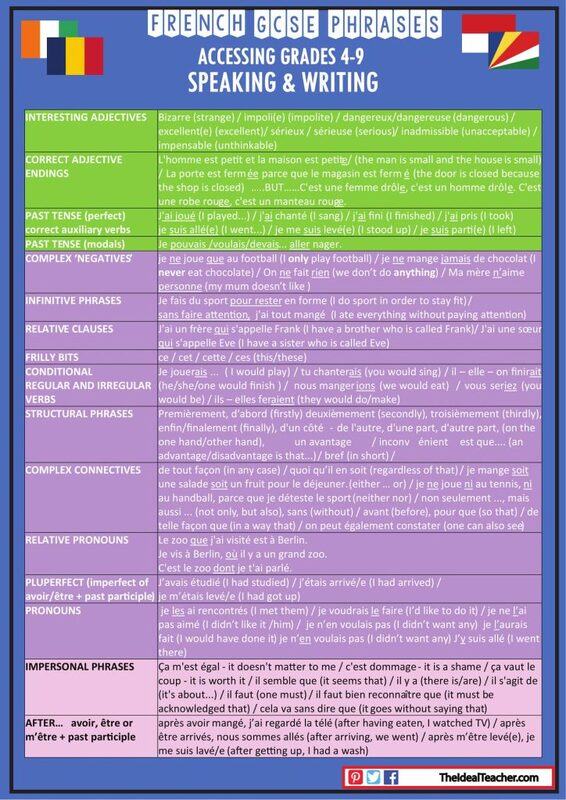 This brand new French speaking and writing document is a super useful 3-page PDF handout for French GCSE students. 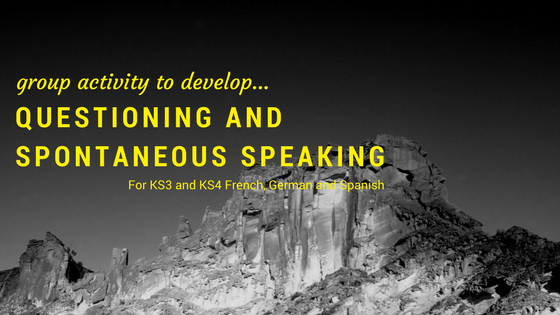 Especially since it contains a list of detailed elements that students should progressively be including in the ‘new’ 9-1 MFL GCSE examinations, presented in an easy to access format. 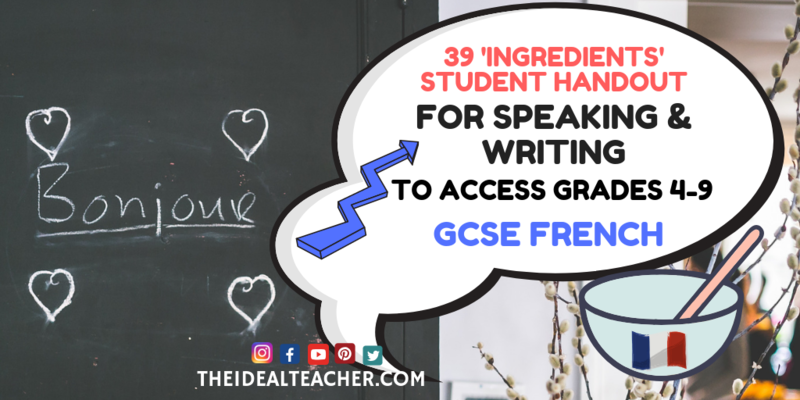 However, it also includes many ‘sparkly elements’, with real examples and translations that students can use, such as relative clauses, impersonal phrases, sentence starters and the passive voice, for example, to access the higher grades. 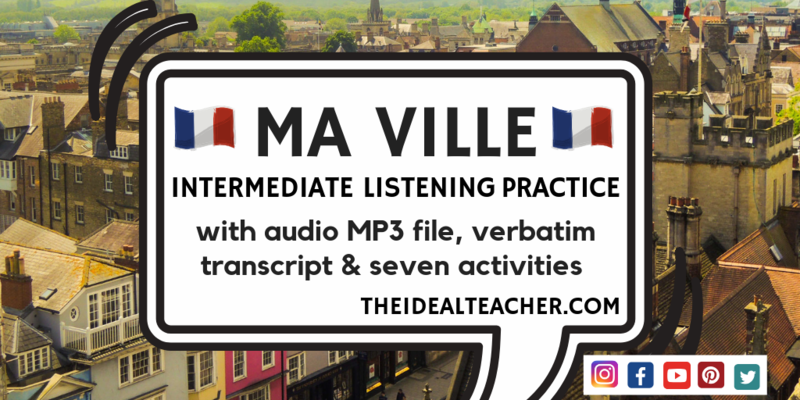 So far, it really has been quite popular with my students (and other French teachers). 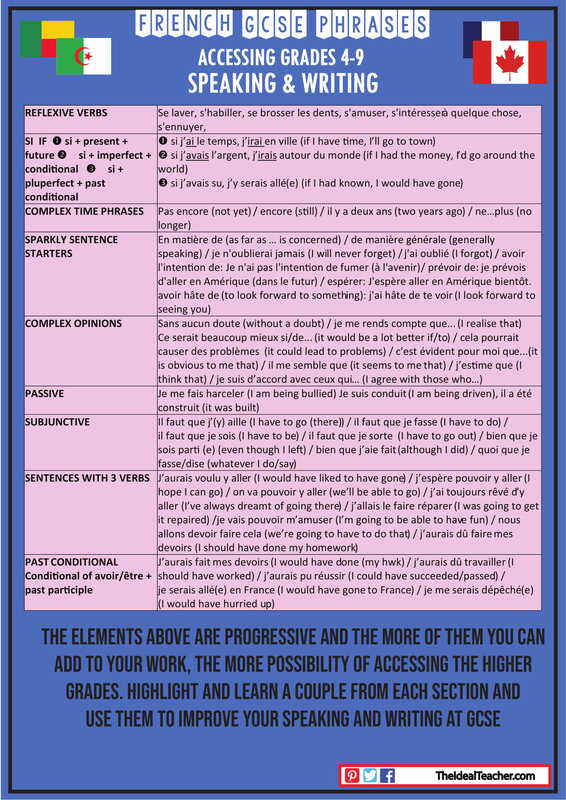 If you think this handout would be useful to your French GCSE students, feel free to download it below. 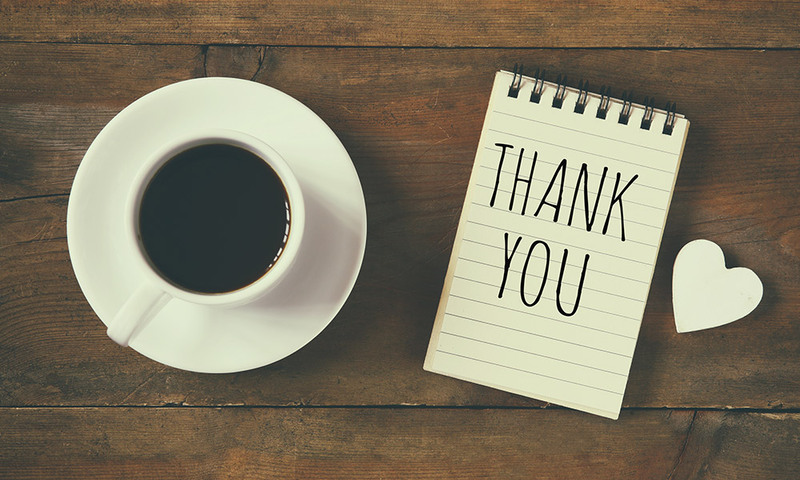 If you do download and find it useful, please consider leaving a small donation. I make all the resources myself and whilst I love to share, it is very time consuming! 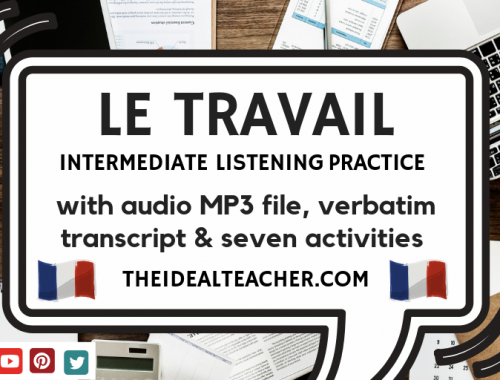 How Should I Use The GCSE French Phrases for Accessing Grades 4-9 in Writing and Speaking with Students? 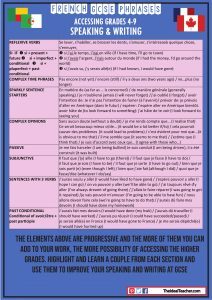 As with most things in teaching, there are a number of ways in which you could exploit the handout for accessing grades 4-9 at GCSE French level in your lessons. With my students, I distributed the handout in the lesson. Students work with it during activities in lessons, as well as during homework tasks to develop familiarity. 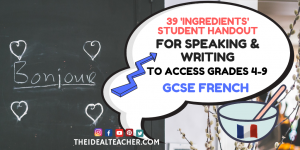 I recommended that they highlight 2-4 phrases from each ‘ingredient’ and aim to use them in their spoken and written work. The students were also asked to learn the phrases, as part of a vocab test, in which they had to expand the words or phrases into ‘on-topic’ sentences. I also advised that they will also be tested generally on the elements at various points, to avoid becoming too reliant on the physical document. As a challenge for those who wished to, I have asked them to go away and add their own original ideas to the list. I took these in for marking and many students had a good go at adding to my suggestions. I found that it gave the learners ownership of the document and freedom to develop their language skills and competency independently. 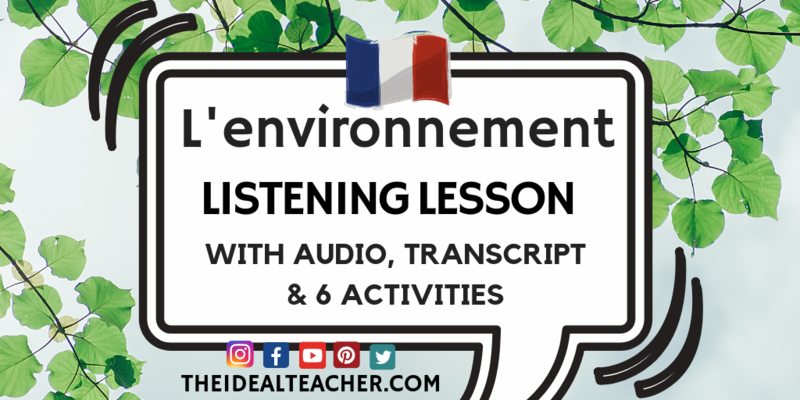 Let me know in the comments below if you found the handout useful for your GCSE French course or if you think I am missing something! Please also share on social media to help colleagues out if it is of use to you. Like this activity? Have you joined my mailing list?